The Minnesota Museum of American Art inspires people to discover themselves and their communities through American art. As a visual arts museum that serves the state of Minnesota, The M strives to make the visual arts more accessible to members of our community through exhibitions, multi-dimensional programs, educational initiatives, and collaborative ventures. 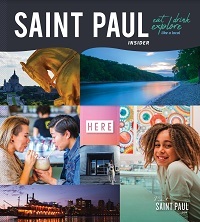 Saint Paul’s vibrant art community absolutely shines during the bi-annual art crawl, but we’ll feed your creative side year-round.